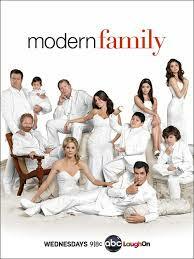 I just watched my first episode of Modern Family, "The Future Dunphys," which aired on April 3. If you haven't seen it, my summary will probably be helpful. If you have seen it, my summary will be underinformed. Here goes: Cameron and Mitchell are a two-dad family who have adopted Lily, a five-ish year old girl who was born in Vietnam. Lily's class has been discussing heritage. One of Lily's classmates explained that, because his parents are Italian, he is also Italian. Lily figures that, since her parents are gay, she must be gay. She tells this to Gloria, Mitchell's stepmother. Gloria is personally mourning her son's loss of his Colombian heritage, and so challenges Cameron and Mitchell to teach Lily about her Vietnamese heritage. They're woefully unprepared, so Gloria has them take Lily to a Vietnamese restaurant. Lily isn't really interested in her Vietnamese culture, and she only identified as "gay" because she wanted to be closer to her parents. They explain, "The three of us are a family even though we grew up in different places... We're a family because we love each other." Cameron and Mitchell do try to provide Lily with access to her heritage. When they realize she's not interested, they stop forcing it on her. It's important for them to make it continually available, but to let Lily be in charge of deciding how big a role it will play at any given moment in her life. One character suggests that sometimes, parents obsess over their childrens' lives because they can't get their own lives and thoughts in order. This might not actually be true - but it does seem realistic that Gloria's own internal grief about cultural issues in her own family impacts the way that she instructs Cameron and Mitchell. Cameron and Mitchell haven't put much effort into learning about Lily's Vietnamese culture; they could only provide her with the most generic of information about Vietnam. Six hours later, and Lily has expressed that she hates Vietnam, and Cameron and Mitchell eagerly leave the restaurant. It's possible that they might consider the "cultural education" part of their parenting responsibilities finished. They shouldn't. On a scale of 1-10, how important is it, to you, that a child adopted cross-culturally has the opportunity to learn about and experience their birth culture? On a scale of 1-10, how important is it to you that the same child takes the opportunity to learn about their birth culture each time they're presented with it? Is there a difference between the two answers? How would that difference play out in real-life parenting? A friend's comment on the Facebook page made me think a bit more deeply about this episode and my review. Here's a little more of what I'm thinking. Mitchell and Cameron were glossing over Lily's heritage - in fact, they didn't really know anything about her heritage. That wasn't good. One of the things that's frustrated me the most as I've trained prospective foster/adopt parents is when they suggest that a child won't have a heritage beyond that of their adoptive family, or that a child won't or shouldn't want to learn about their heritage. I've been much more impressed by families that actively incorporate their child's heritage into the family. In the course of working as a social worker, I've also learned about my own heritage - My skin is white, sure, but I've learned to value my roots as a Polish person. I wish that Cameron and Mitchell would learn much about Lily's culture, and incorporate it into the family's daily life. It didn't go that way in the episode. The way that it happened seemed to be that a friend pressured them into taking Lily to a Vietnamese restaurant, with the expectation that a conversation with a waiter and a bowl of pho would make Lily understand what it means to be Vietnamese. The problems with that were that, Mitchell and Cameron have no idea about Vietnamese culture, the meal was at the insistence of a friend - not on their own volition or Lily's volition, and a one-off stop at a restaurant isn't so much incorporating Lily's culture into their life, but just trying to expose her to it, briefly. Also, Lily wasn't interested. In that instance, I wonder if their best course of action was to back off at that point, educate themselves more fully, and then bring it back to Lily - making sure that they're prepared to provide her with a real understanding of her culture, and to make experiencing her culture part of everyday life, rather than making it an addendum to life. I don't know if they're going to do that. Hey Rachel! Thanks for that correction :) I fixed it! Yes, just as the gay dads identify with their lifestyle, have parties and friends who are gay, they need to encourage the cultural identification of Lily--through more than just a trip to a restaurant. Even though it's just a 30 minute episode with a large cast, I hope they can revisit this topic. Just the fact that they showed that they need to do a better job educating Lily is a great step in the right direction -- especially for such a mainstream show. JaeRan Kim said something really interesting on the Adoption at the Movies Facebook page - an analogy she uses when parents seem relieved to be off the hook due to a kids' disinterest in their birth culture is, "Well, if your kid said that weren't interested in going to church or school, would you let them drop out just like that? Probably not, because you see it as important." JaeRan suggests that birth culture is also important and should merit the same parental perseverance. I haven't seen this show but I loved this review. I do think it's important for children to have the opportunity to learn about their heritage and while visiting a restaurant could be part of that - by itself it is pretty superficial. There are so many other great ways to learn about culture through children's books, movies, celebrating important holidays from that culture, seeking out friendships with families from that part of the world. In my opinion it should be a constant part of family life and not just a one off experience. I think you're right! I was at a training a few years ago, and while talking about adoptee culture, they encouraged us social workers to explore our own heritage. "No one is "just white" or "just black" they said... So I tried to learn what it means to be Polish, Scandinavian, German, and I found it really powerful to listen to music sung in the language that my ancestors spoke, to eat Polish food... Actually, the first thing that struck me was, as I was reading through a Poland travel guide, I saw a picture of a farmer, and realized that that's the first time I've found a stranger that looks like me. It was really powerful. Modern Family is a really good show to review! I suggest you watch the whole series up to this point, because I think there's a lot to work with/ talk about. The adoption theme is throughout and is really interesting, even if they don't always do things the "right" way. They can normally find the humor in it all. Hi Alice Anne! Thanks for this comment. I think I would like to do the whole series, and I think it'd be fun to comment on current episodes, too. Thanks for the suggestion!